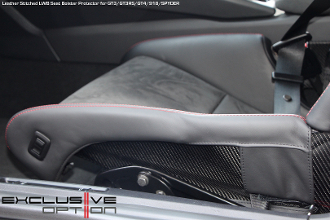 These are our tailor made 918 style LWB Seat Bolster Protector set (Fit GT4, GT3, GT3RS, 981 Spyder and 918). The set comes with driver side and passenger side outer bolster protectors. They come with all attachment hardware and are made with full OEM spec Leather with Matching deviated stitching. Once Installed they look very close to the OEM factory seat covers. They fit very tight and give the outer bolster full coverage. These covers fit like a glove and install easily with no permanent modification to the seat. Upon First glance most do not even notice that these are add-on covers as they integrate into the existing seat design very nicely. This is a great way to save those expensive buckets from scratches and excess wear. Please allow 2-3 weeks from time on order for delivery.